I agree. Thanks. Regarding the part of smudge that is connected to the Hay, there is probably more reason to be Maikil, since it probably was always connected to the Hay, but in any case, you're right that it should be discussed with Moerh Hora'ah. Of course! as the same applies to all such questions on this forum. One should not use this forum as a substitute for proper "shimush" or a proper rabbinic ruling. 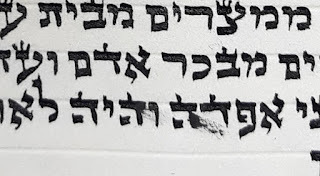 See the beginning of קול סופרים in the letter he writes to his brother, paragraph 25. Therefore all we can do is to help an other sofer with sources so he has what to present to the Rov. That is correct. This is exactly what I am looking for: Sources. There's 2 issues here. 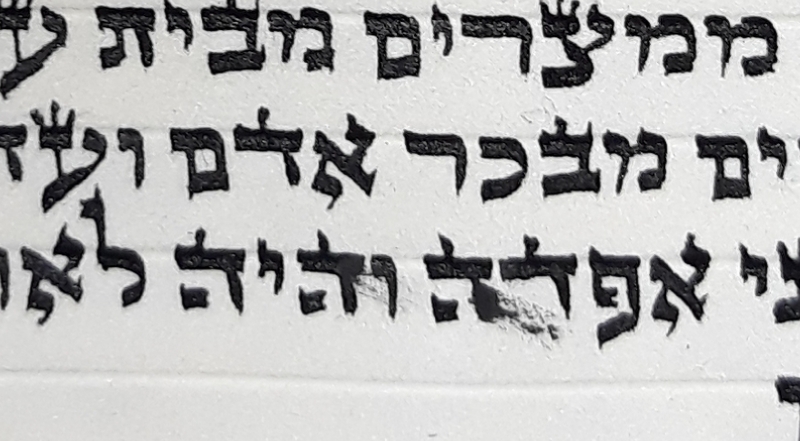 What seems to be the slightly less concerning is part of a letter going into another, the ink connected to the leg of the Hei into the Dalet. If this were the only ink inside the Dalet then I'd think a tinok would suffice and if so, all would agree that the Hei need not be covered. The more concerning issue is the loose into (particularly the one bit that is pretty close to the lower left hand corner). According to the Rosh/Tur this would suffice to make it a kosher Hei and according to those who hold the SA agrees with the Rosh, would be pasul as well and the the Chazon Ish and Maamar Mordechai would consider it a Peh so it would seem difficult to machshir. I'll look up the source when time permits. Please elaborate for the forum members and visitors. Thanks again! Teshuva in Tzemach Tzedak is indeed very interesting.